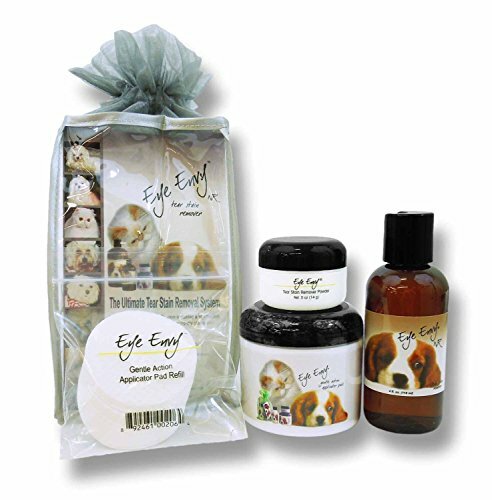 Eye Envy NR Tear Stain Remover Deluxe Kit for Dogs, works great for cats too! No refrigeration is required. THIS DELUXE KIT INCLUDES: 4oz bottle of solution, 0.5 oz jar of application powder, Jar of dry non-woven application pads, package of refill application pads, detailed application instructions, packaged in a silver and clear vinyl bag. Eye Envy is an externally applied tearstain remover that truly works! Eye Envy is a proven formula being used by Breeders, Groomers, and Veterinarians as a safe and effective means of removing tear staining. It is also effective in treating urine stains, red yeast infections, and food stains. Whether you are preparing for competition or just maintaining your pet's quality appearance, Eye Envy is an international pet grooming aid of choice. The Eye Envy tear stain removal system is a multi-step process, and the Deluxe Kit contains everything you need to get started. Eye Envy works at the true problem, a bacterial infection. The complete Eye Envy set contains a cleanser, an astringent (to dry the area), an herbal flower extract (acts as a natural antibiotic) and an antibacterial. Eye Envy is a topical tear stain remover that does not contain bleach or peroxides and will not cause discoloration. Other products are often masked as palatable supplements, taking months to work and requiring your pet to ingest antibiotics. Since Eye Envy is applied externally, it is 100% safe to use on pregnant, lactating and even small dogs or cats (over the age of 8 weeks). If you have any questions about this product by Eye Envy, contact us by completing and submitting the form below. If you are looking for a specif part number, please include it with your message.